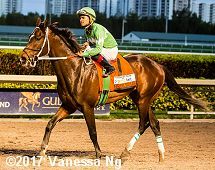 One of the major paths to the Kentucky Derby is through Gulfstream Park in Hallandale Beach, Florida. 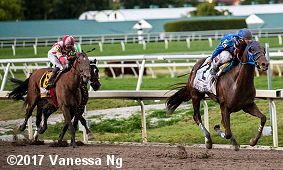 On Saturday, a field of ten 3-year-olds contested the $400,000 Xpressbet Fountain of Youth Stakes (G2), a 1 1/16 mile main track trip worth 50 points to the winner as part of the Kentucky Derby Championship Series. Conditions were excellent at the Hallandale Beach oval, with overcast skies, high winds, and temperatures in the 70's. 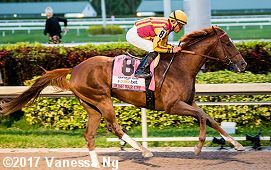 Holy Bull Stakes (G2) winner Irish War Cry was sent off as the 11-10 favorite. 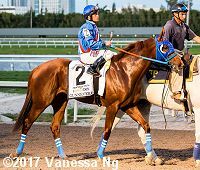 In to challenge him included 7-2 second choice Practical Joke, unraced since finishing third in the Breeders' Cup Juvenile (G1), and 4-1 third choice Gunnevera, winner of the Delta Jackpot (G3) then second in the Holy Bull. 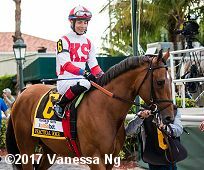 Jockey Luis Saez sent 7-1 fourth choice Three Rules to the front and he set fractions of 23.43, 47.18, and 1:12.37 while pressed by Irish War Cry and stalked by 14-1 Takaful. Entering the lane, Irish War Cry tired badly while Gunnevera, well back early under Javier Castellano, swept 4 wide to lead through 1 mile in 1:37.85. 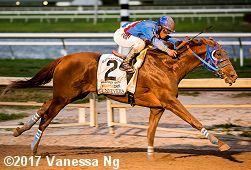 Kept to task by Castellano, Gunnevera powered away to a 5 3/4 length win over late-running Practical Joke in 1:44.25 over the fast main track. It was another 1/2 length back to pacesetter Three Rules third, while favorite Irish War Cry checked in 7th beatem 12 3/4 lengths. Undercard Stakes - 7 more races, including the Mac Diarmida Stakes (G2) won by Wake Forest and the Canadian Turf Stakes (G3) won by Heart to Heart. Left: Gunnevera in the winner's circle. 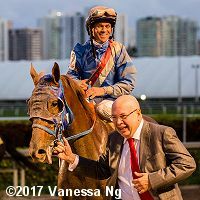 Winning owner Solomon Del Valle of Peacock Racing Stables said, "I am the happiest man on earth. I thank God, Antonio Sano and Javier Castellano. All three champions. This is my biggest win. I've been around horses since I was 5 years old. I've had as many as 40 horses in Venezuela. Antonio bought this horse for $16,000. Incredible. I love this horse. I get up every day at 4 a.m. to see the horse. I was 100-percent sure he would win today." Right: Gunnevera heads back to the barns. 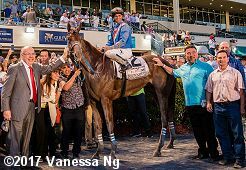 Winning trainer Antonio Sano said, "I feel very happy. The last race he lost the race because he got bumped on the turn into the stretch. This was different � more horses, different speed. I thought 100 percent that he would win today. Castellano told me, he did it very easy. Castellano never win the Kentucky Derby. For me, it's the first time. This is the year." Left: Gunnevera in the post parade. 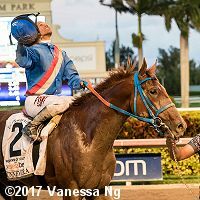 Right: Winning jockey Javier Castellano celebrates aboard Gunnevera after the race. 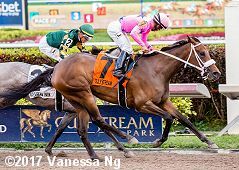 Castellano said, "He's the kind of horse where you have to make one run. You can't chase the pace, because you're not going to finish. I tried to do that a little bit last time, but I learned my lesson. I was able to learn and move forward and it paid off today. I took my time with him. He's a very professional horse. He's a 3-year-old horse but he acts like a 6-year-old. He's an old pro. The way he was in the post parade, he was very composed and he waited in the gate. He broke from the gate and I could have been a little closer to the pace and chased a little bit to secure my spot in the first turn but I didn't. I took my time with him. I let him follow the pace and he started picking it up little by little. Turning for home, I knew I had it. I knew because of the way he did it when I asked him, he responded very well." Left: Second place finisher Practical Joke heads out to the track before the race. Trainer Chad Brown said, "I think I got the race I needed into my horse. Jose (Ortiz) is very happy about the race. He continues to learn a little bit about this horse. He was happy with his effort, as I was. He's in play now. He has a race under his belt. He should move forward off of it. Everything is on the table (for his next race). A lot of it is going to depend on how the horse is training, who is running where, and what I'm most comfortable with." Right: Third place finisher Three Rules returns after the race. Jockey Luis Saez said, "He was trying good, man. When he came to the half-mile pole I thought we had it easy. But when I started to ask him, he made a little noise. That's why think he got tired. If they check and they find something happened with him, he's going to be a nice horse. He's a very nice horse. I thought we were going to win." Seventh place finisher and beaten favorite Irish War Cry crosses the finish line. Trainer Graham Motion said, "Joel (Rosario) felt he was in a good enough spot. I wish he had maybe settled a little more off the pace perhaps, but I don't want to make excuses. He looked like he was going pretty nicely. I can't really say what happened, whether he bounced or not. He ran an awfully big race last time. He looks fine. My instincts and first reaction is that possibly I ran him back too quick. It's hard to know. He's done so well between races." 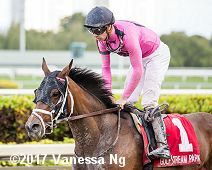 The $200,000 Fasig-Tipton Davona Dale Stakes (G2) for 3-year-old fillies is the first Florida race in the Kentucky Oaks Championship Series worth 50 points to the winner of the 1 mile main track trip. 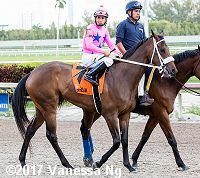 Tempted (G3) and Demoiselle (G2) winner Miss Sky Warrior was the 2-1 favorite in the full field of 14 over 3-1 Pretty City Dancer, second in the Forward Gal (G2), and 9-2 Eloquent Riddle, second in the Furlough. 44-1 Ellie's Honor led exiting the chute through an opening quarter of 23.65 before 19-1 Jordan's Henny took over through a half in 46.60 while pressed by 8-1 Modacious and stalked by Ellie's Honor. On the far turn, Modacious gained a short lead through 3/4 in 1:11.66, however Miss Sky Warrior and jockey Paco Lopez, who sat close up in 4th the whole way, swept to the lead through 7/8 in 1:24.50, and outfinished Jordan's Henny through the stretch to win by 1/2 a length in 1:38.49. It was a neck back to 9-1 Summer Luck third. 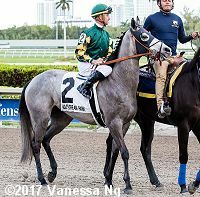 Left: Miss Sky Warrior in the winner's circle. 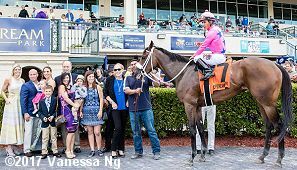 Winning trainer Kelly Breen said, "I like to think the further she goes, the better she goes. She had a great post position (7) and was able to stalk [the leaders] from the outside. The stars were aligned, and everything worked out great. There will be some decisions to be made," he added. "We'll see how Unique Bella runs in California today. Maybe we have to step up our performance to run against her, and maybe we will meet up in the Kentucky Oaks. 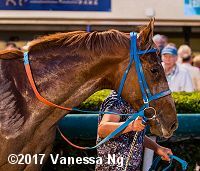 To have a horse of this caliber is a lot of fun." Right: Miss Sky Warrior in the post parade. Winning jockey Paco Lopez said, "I know she has more speed, but I wanted to keep her in the middle of the track. I stayed four or five lengths back. I waited and waited before I asked her. Someone came to the outside, and I hit her one time and she gave me her run." Left: Second place finisher Jordan's Henny in the post parade. Right: Third place finisher Summer Luck returns after the race.